If you are new to All-in-One WP Migration, you may want to check out our video tutorial for more details about how to export/import using All-in-One WP Migration to complete your WordPress migration. Once you have migrated your site you will need to log in with the username and password of the site that you imported. The users and passwords from the old site have been migrated to the new site so you need to use these credentials. You only need to fill in Find/Replace if you want to replace values in the database. It is optional functionality for advanced users and is not necessary for a backup or migration. There is no need to use this option in the course of a normal migration. The plugin will take care of renaming the elements of the site to the URL that you import to. This is an advanced feature that should be used with care by people that understand the construct of the WordPress database. If you aren’t sure, then just don’t use it. Would love quick written instructions, easier to follow. Would you like written instructions on export or import? I have used your free plugin many times and I am very happy with it but all of the sites were below 512MB. I have a website now which size is 1.5GB+ and I need to migrate my website from one hosting to another. My question is, if I purchase your “Unlimited Extension” will I be able to migrate my website smoothly? What hosting is your new site hosted with? I need your response please! I was waiting for your response. I really need to know it. Yes, we support WP Engine. You can use it to migrate your website to and from WP Engine. Hi I purchased the plugin extension to enable uploads of more than 512 MB with All I One Migration, but as yet do not know how to install and use it, your guidance would be much appreciated. On your dashboard, click Plugins > Add New > Upload Plugin > choose the Unlimited Extension (.zip file that you have downloaded). .Hi Pim J, Thank you for your reply, just to be clear, do I uninstall the free A,I,O,M Plugin ? first, or leave both installed ?. if both installed do I need to connect them in any way ? I have attempted with both installed and could still not upload over the 512MB limit, this confusion on my part is why I contacted you in the first place (sorry to be a numb nut). http://www.webberry.net sent an invalid response. Please copy the error and send it as well as a list of all plugins you are using on http://www.webberry.net to support@servmask.com. Quick question… I purchased the multisite extension – is it possible to backup and restore a single site within a multisite without affecting other sites in the network? On import/restore, the plugin will not overwrite your entire network. During the import process, you will be allowed to select the subsite where the site will be imported to or create a new subsite. You can also run an export of your entire network as a backup before import. Thank you so much for the update, Salil. The demo video is great and I have tested it on single site which works smoothly. I am now trying to import a single site into a multisite instance hosting on AWS. we have also purchase the multisite extension and have it network activated on the multisite admin dashboard, however I still don’t see the plugin showing up on the dashboard when I reach the individual site’s dashboard. I tried importing the .wpress file on the admin level but I believe it’s not the right place to? I am wondering how to do this kind of import properly, it will be great if you can give some quick suggestions! You will have to import the .wpress file on the Network Admin page. The plugin will not overwrite your entire network. During the import process, you will be allowed to select the subsite where the site will be imported to or create a new subsite. You can also run an export of your entire network as a backup before import. Please let me know if you have any questions or send an email to support@servmask.com for premium support. Can we exclude .zip files by extn? Or for that matter can we exclude files by specified extn? Export and import was successful, but going to the home page or any other page leads to a blank page. Please advise. Thanks. A snap to use but I had to work pretty hard to find instructions. No offence and just trying to help improve the product with these thoughts. It took way to many mouse clicks to find my way to here to find out what I was doing wrong. Before I started it would have been good to know I didn’t need to do any search and replaces of old and new url and just go for it. I just clicked on stuff and hoped for the best due to no available documentation. Also, when the initial file creation was happening and it flashed green and said download. I wasn’t sure it was actually finished doing it’s thing and if it was safe to click on it and so I watched it throb for at least a minute because it also gives me the option to ‘stop’ which might mean it’s still working. It needs to say 100% or We’re Done here! a honk or a ding etc and not two conflicting statements. Perhaps this video link in as may places as possible! Again, nothing but thanks here. I was confused and thought I’d share it. Unable to Import – Object doesn’t support this action. If you are unable to export, you can use FTP to get the file from the backups folder in wp-content. EXCELLENT concise how-to! I used it, crossing my fingers as to the weird & seemingly now inaccurate step 4, … and it DID seem to work fine. I’m especially impressed because one of your more formidable competitors (a) didn’t work as well; and (b) played the “let’s go through 5 minutes of you proving your entitled to support,” even though I’m working for a paid customer of theirs. YES, going to a new host & a new name has to be a VERY common scenario, so if the absence of search/replace means that my new “build” is going to be heavily reliant on the old one, … well, you can see a handful of issues surrounding that!! The migration doesn’t require you to use the find and replace, but it is there if advanced users want to change something in the database. WE recommend that customers just let the plugin do it’s job – which it does well. 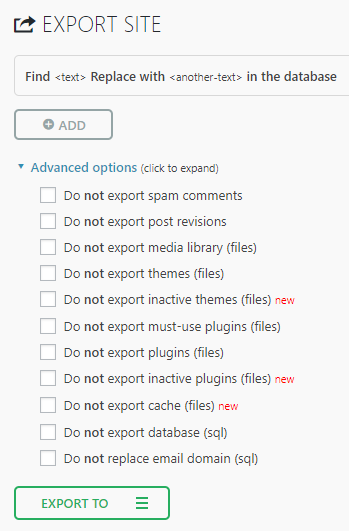 I want to import a blog WP install into an established WP website in a subdirectory. In other words I want two databases. I don’t want to disturb the website WP db unless, there is a way of combining both dbs. How can this be done? The blog is currently a subdomain and I want to convert it to a subdirectory. Simple … but not. They say subdomains count as two sites. I want one site for better SEO. You can contact us at support@servmask.com to have this transferred professionally. Hi, I just import a single site but ist takes now over an hour and progress is 0% at the point “restoring” database. Could it be? Or can I make a restart? How long does it take normally (with an 2GB-File)? Can you try opening a new browser tab of your website to see if you get any error? I have a similar question to Philip’s. I want to create a copy to a subdomain for testing purposes. How do I make sure I don’t accidentally use the same database as my online site? I am using a staging-server running on the sub-domain `dev.` Some links in the pages ACF-Fields are “hard-coded” (i.e. strings that need replacing) and are formatted as `dev.xyz.de/permalink` or `dev.xyz.com/permalink`, depending on the language. When migrating the site I want those values to be replaced by `xyz.de` or `xyz.com` respectively. Unfortunately the text-replacement functionality ai1wm offers doesn’t seem to work reliably in this case as some links are getting properly replaced and some are overwritten with the default-language’s domain, meaning that `dev.xyz.com/permalink` gets replaced by `xyz.de/permalink`, thus pointing to the wrong language. how do i get the premium version to export / import a larger website….do i need to buy it twice one for each site? You can get it from here – https://servmask.com/products/unlimited-extension. One license can be installed on all the websites that belong to you. Please reach out to support@servmask.com if you have further questions. Hi, so i worked for the past few weeks on a new site on a local host for my job. I want to import it in the actual wp site (which is the ”ancient” version). Do I need to erase everything (and do backup of the ancient version) before importing the new version on the actual wp site? What happens if I import the new site on an existing site that already has multiple pages? Existing pages are in the database and they will be overwritten upon import. There is no need to erase everything before import.